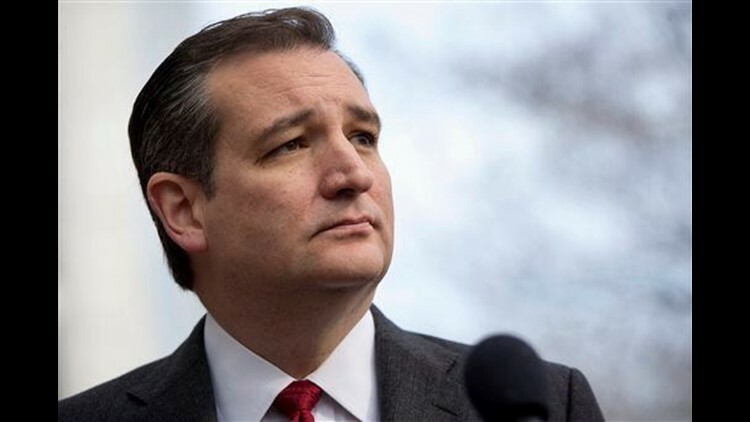 WASHINGTON (AP) — Ted Cruz embraced Jeb Bush's endorsement on Wednesday and claimed he could build a broad coalition capable of beating Hillary Clinton in the fall — if only he can climb past the surging Republican presidential front-runner, Donald Trump. Clinton won in Arizona, maintaining a lopsided advantage over Bernie Sanders in the Democratic race despite his convincing wins in Utah and Idaho on Tuesday night. Trump and Cruz split the previous night's two GOP contests, the billionaire taking Arizona and the Texas senator winning Utah. Bush, the former Florida governor once considered a mainstream Republican powerhouse, dropped out of the contest in February after weak showings in early primaries. "Ted is a consistent, principled conservative who has shown he can unite the party," he tweeted. Bush added on his Facebook page that Republicans "must overcome the divisiveness and vulgarity Donald Trump has brought into the political arena" or risk losing to Clinton. But Cruz has a long climb if he's to catch Trump in the delegate count, and it's even harder with Ohio Gov. John Kasich still in the hunt. "I think he'd be a tremendous addition to an administration," Cruz said pointedly on CNN, praising the governor's talents while suggesting Kasich should get out of his way. Mitt Romney, the 2012 nominee and a leading anti-Trump voice, helped Cruz win Utah, a factor cited by the senator in claiming his appeal is growing beyond the very conservative and religious voters who have powered his victories in some primaries and caucuses. The latest nomination contests unfolded with Belgium reeling from deadly attacks. Contenders in both parties tried to convince voters they can best protect the U.S. from terrorists. The Islamic State group claimed responsibility for blasts in Brussels that left dozens dead and many more wounded. "This is about not only selecting a president, but also selecting a commander in chief," Clinton said in Seattle as she condemned Trump by name and denounced his embrace of torture and hardline rhetoric aimed at Muslims. "The last thing we need is leaders who incite more fear." Trump, in turn, branded Clinton as "incompetent Hillary" as he discussed her tenure as secretary of state. "Incompetent Hillary doesn't know what she's talking about," he told Fox News. "She doesn't have a clue." Cruz said authorities should be empowered to "patrol and secure Muslim neighborhoods before they become radicalized," drawing a sharp rebuke from Muslim Americans and civil rights groups. The victories for Sanders and Cruz kept the front-runners from dominating another election night, but both Clinton and Trump maintained a comfortable lead in the race for delegates who decide the presidential nominations. In London, a senior British counter-terrorism police officer condemned Trump's assertion on the "Good Morning Britain" TV show that that British Muslims are not reporting extremists in their communities to police. Deputy Assistant Commissioner Neil Basu told BBC Radio on Wednesday that Trump's comments are wrong and could raise tensions. "If we demonize one section of the community, that is the worst thing we can do," he said. "We are absolutely playing into the terrorists' hands of making people feel hate." Trump's brash tone appeared to turn off some Republican voters in Utah, where Cruz claimed more than half of the caucus vote — and with it, all 40 of Utah's delegates. Yet that wouldn't make up for Trump's haul in Arizona, where he earned the state's entire trove of 58 delegates. The win in Arizona gave Trump a little less than half of the Republican delegates allocated so far. That's still short of the majority needed to clinch the nomination before the party's national convention this summer. Overall, Trump has accumulated 739 delegates, Cruz has 465 and Kasich 143. It takes 1,237 delegates to win the GOP nomination. Associated Press writer Gregory Katz contributed to this story from London.